Here is a link to an interview I did with educational/inspirational art site Pencil Kings. We talk about freelancing, working while traveling, a few other topics....and if you listen carefully you can hear my wife messing around in the kitchen! Thanks to Mitch Bowler at Pencil Kings. With increased interest in prints of my work over the last little while I've decided to open a shop section on my website. 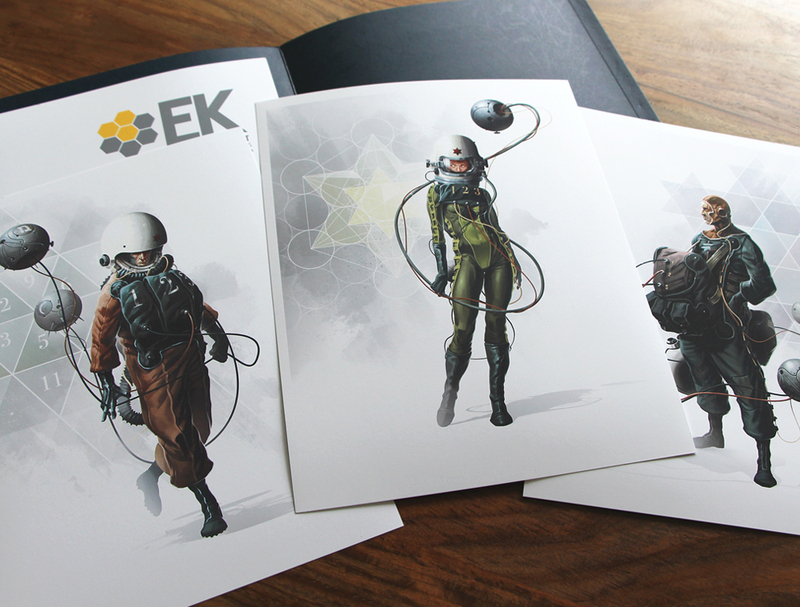 A selection of prints, both limited edition high quality giclees and smaller open edition digital prints are available. I've also included the first of several t-shirt designs, and signed copies of my book, Born In Concrete: The EK Series. The shop is currently open to the USA and Canada, but international shipping options will be added soon. For those interested in non-signed versions of my book, please order those through Amazon (the cheapest and quickest way) or directly from Design Studio Press. As for the Industria Mechanika model kits based on my work, please visit the Industria Mechanika Shop for availability and ordering. The Japanese language edition of my book, Born In Concrete: The EK Series, has been published by Born Digital Inc. in conjunction with Design Studio Press. The content of this edition is the same as the original English language version that was published by Design Studio Press back at the end of 2013, but the book has been reformatted down to a new size of 9"x 10.5" (as opposed to the 11"x 13"of the original), bound with a soft cover, and fully translated into Japanese . While the images maybe don't have the same impact at this new smaller size, the book looks great, with the Japanese text giving the book an exotic feel and the coated paper stock (both inside and on the cover) giving the images a softer more satin finish. It even has that little title/price card folded into the book like all Japanese books seem to have. So cool! I'm a big fan of Japanese art books (mainly animation production books), and it was great to see my book interpreted in this fashion. The book is available from Born Digital here, of Amazon.jp here. The original, English language version is available here. As for the original version of the book, due to it being featured (along with my Dystopic model kit) on the online show "Tested", it has spent the last 5 days as the #1 top seller on Amazon in the digital art category. Thanks to those that picked up a copy of the book….it is much appreciated! Thanks to Scott Robertson and Tinti Dey at Design Studio Press and the guys at Born Digital Inc. 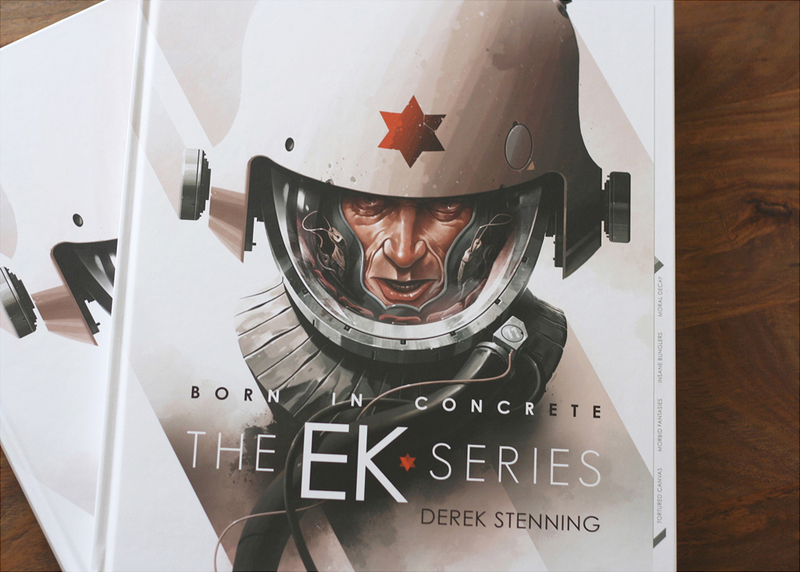 Tags derek stenning, entartete kunts, born in concrete, Born In Concrete: The EK Series, Design Studio Press, Born Digital Inc.
Art and entertainment industry site Coloured CG has a feature of my book Born In Concrete: The EK Series. The article is full of page samples and a video flip-through of the book. Thanks to George C. Antohi and Coloured CG.